Overwatch is about to get spooky once again, as Blizzard has confirmed that the limited time event, Halloween Terror, will return on October 9th. A teaser posted on the official Overwatch Twitter page shows the Arcade map Chateau getting a creepy makeover before we hear the familiar cackle of Dr. Junkenstein, Junkrat’s Halloween alter-ego. All of the previous Halloween cosmetics, including skins, highlight intros and the like, will no doubt return, accompanied by a host of new ones. The details of this new content, we can only speculate. As is standard practice in Overwatch LTEs, epic skins from previous years will run you 1000 credits, while the new drops will cost a spooktacular 3000. The more interesting thing to speculate about is the possibility of new PvE content that may come with the update. 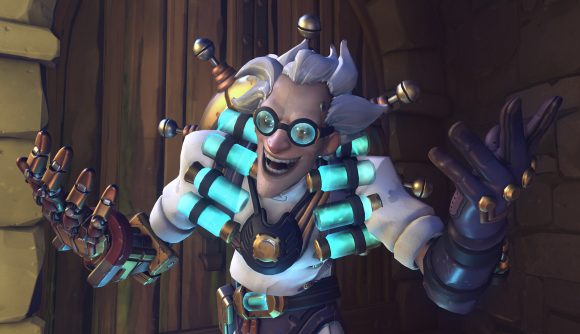 Junkenstein’s Revenge is a co-op survival mode, akin to Call of Duty’s Zombies modes, that was introduced for Halloween back in 2016. This limited time mode was the first PvE content to come to the game and returned for Halloween 2017, as well as the Anniversary Event earlier this year. Included in the post was an R.L. Stein-esque poem, that may allude to updates in PvE content. It seems likely that the horror-themed rework of Chateau will play host to any co-op updates that may be coming down the line, just as a modified version of Eichenwalde was used for the original Junkenstein’s Revenge. Given that we haven’t had a new brawl since April’s Retribution mission, we’ll be hoping for some big new things in this update. Perhaps a new type of boss that isn’t just a reskin of existing heroes? Overwatch Halloween Terror 2018 kicks off a week from tomorrow and will run until October 31st.